Unquiet Time | Because life is loud. 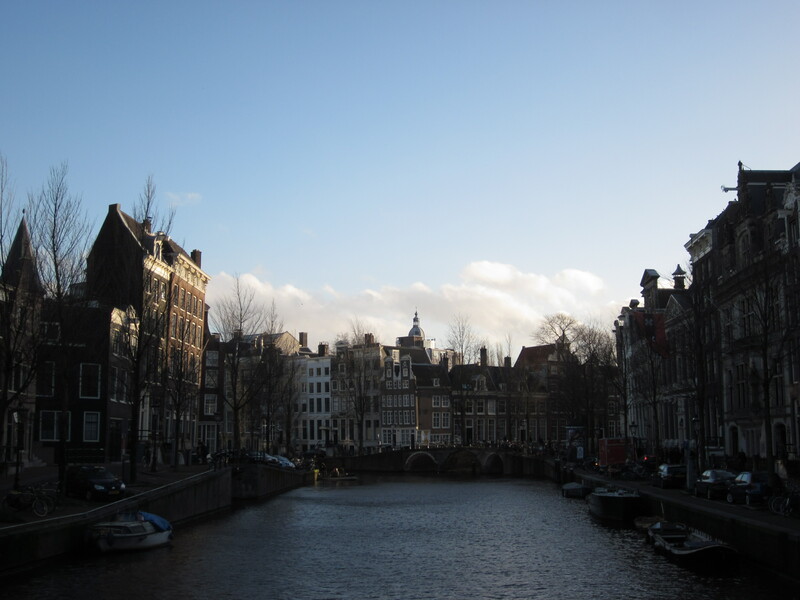 If you read this blog, you know that when our expat experience in the Netherlands came to a close in 2014, I felt like the doors of the world had shut in my face. It was worse than the worst breakup of my younger years, and in some ways strangely similar. There was the moping. The tears at the sight of a photo, or a friend’s reference to the Lost. The feeling that nothing mattered due to the Loss. (Maybe you handled your breakups better than I did?) There were too many mornings when I sat on the $40 brown couch we bought used on Craigslist (maybe you buy better couches than I do, too) and stared out the windows at my own definition of suburban bleakness and couldn’t figure out how to get started, or where to go, or why. The world, it seemed, had gotten small. But it wasn’t stagnant, and in October we found out I was pregnant. There are missing chapters from this blog on our years overseas, that were too personal at the time to write— unsaid posts on Dutch hospitals and healthcare, hopes for a baby in a bakfiets that never quite materialized. And then (I kid you not) six months to the day from our move back to the US, a positive test. We held our breath, and we waited. Things were well, and then gradually and quickly they weren’t, and in March I was admitted to the hospital in early labor at just shy of 24 weeks. Delivery was averted and a sleepless night spent and in the morning we realized, I wasn’t going home. I had a host of problems and a high risk pregnancy and no idea that when we’d walked in the doors the afternoon before, I wouldn’t walk out for more than a month. 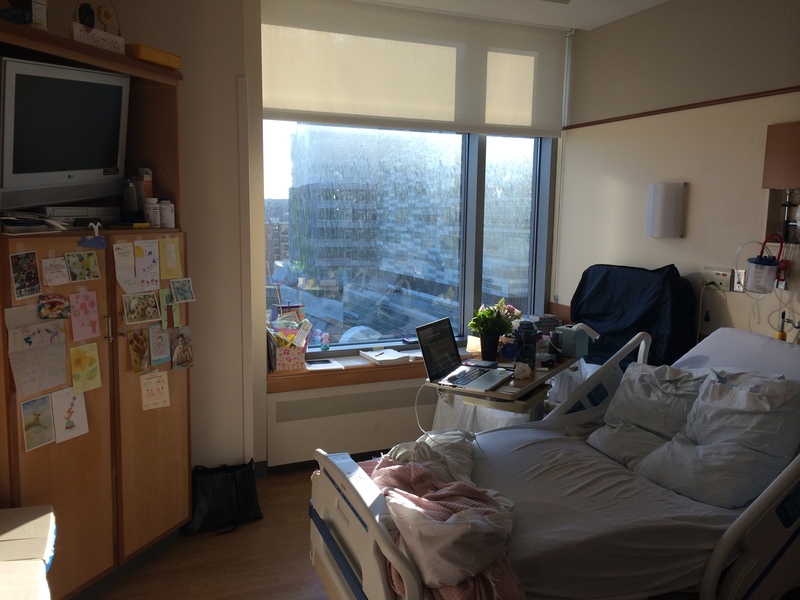 Tim went home and got my things and I was moved to bed rest in the area of the hospital called antenatal— a surreal, numb world I had no idea existed, and I hope you didn’t, either. 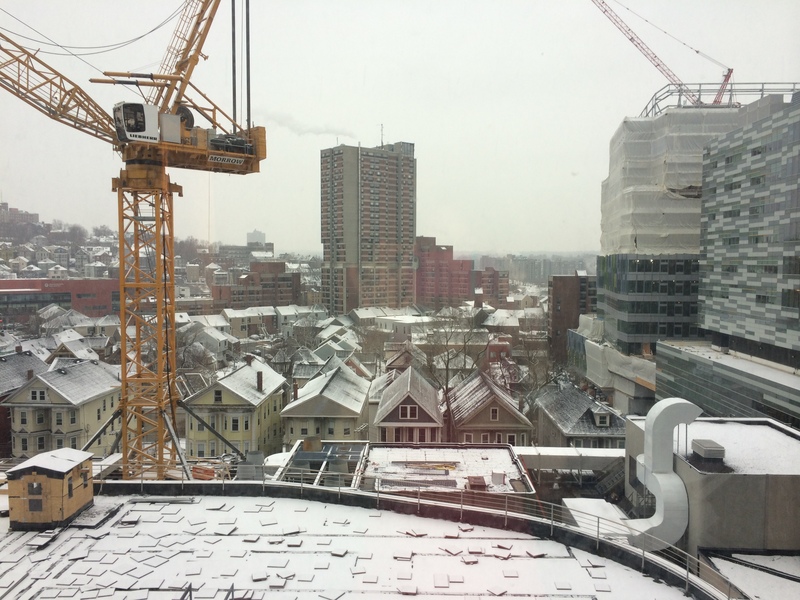 For more than a month I sat in a hospital bed in a room that was tiny and private, with a window that looked over a construction project. Winter was stuck on play and the scene was always drab. The nurses who came and took my vital signs and listened to the baby every four or five hours or who called transport to wheel me in a bed for an ultrasound two times a week (the only times I left the room) repeatedly informed me that I wasn’t missing any good weather. As far as I could tell, they were correct, but it didn’t really help. You might think that being on bed rest would give a person a lot of time, but my mind didn’t work. I discovered Instagram (we never had smartphones overseas) and followed anything I could find relating to Paris, Amsterdam, cooking (hospital food making traditional Dutch cuisine look innovative, spectacular). My phone would flash the weather from my favorite cities and I would marvel that all of these places were existing, somewhere, right now, while I sat in a bed and watched Boston’s dirty snow melt. I couldn’t help thinking that this was all a very cruel joke. I’d thought the world was small before? Now I knew what a loss of freedom really meant. Our world, in the extremely short span of time a C-section actually takes, zoomed down to 3 lbs, 5 oz. She was whisked away to a little plastic incubator which around her appeared gigantic, and for 10 weeks she stayed, not always in the plastic incubator but always in the NICU at what we had to admit we were glad was a first-rate American hospital. In July (her original due date was July 1) she came home, with an oxygen tank (now gone) and a tiny little cry and the bluest blue eyes in the world. Though at first it was hard, we leave the house now—going “out in the world,” I always tell her. She looks at me and laughs and I think she understands. The world, I would whisper to her in the hospital, is not a tiny room with beeping and lights and needles and cords. Tell the other babies. She isn’t ready yet— for airports and bicycles, unfamiliar bus routes, food on forks at a foreign cafe. And so we learn patience together, and remind ourselves that the world is always both smaller—and bigger—than we expect. The other day I went to a secondhand shop in Cambridge and saw a piece of furniture I used to own. It was a stingingly cold day and I was looking for a small bookcase to sit in the kitchen and solve my cookbook problem. The MIT Furniture Exchange is a volunteer-run warehouse-y space a decent walk from Central Square, and in the summer we struck gold there when we bought our massive, quirky antique bookcase (at a very reasonable price). Like any secondhand shop, the FX is hit or miss. Occasionally you win, and most times you do a quick ten-minute loop and realize it’s not your lucky day. This time, I had done the ten-minute loop and was heading for the door when a little table caught my eye. It was small and painted forest-green, though this was certainly not its original hue. 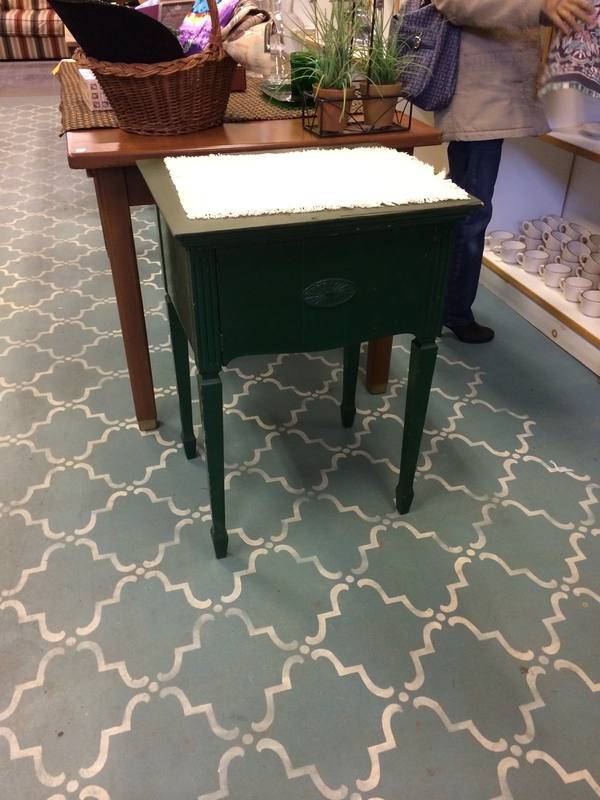 Spindly wooden legs belied what I already knew—this is an antique sewing table, and it weighs a ton. They’d put a decorative cloth on the top, but if I lifted it up, the top would fold out to one side, revealing the heavy (and nonfunctional) machine. The front of the table is a door, and I popped it open to reveal the little caddy holding the original manual and bobbin box—currently kept in a Ziplock bag that I believe I provided. It was all still inside. At first it seemed too radical to believe that this was the piece that once sat in my bedroom(s), back in my early Boston roommate days. But there was no doubt about it; this wasn’t some IKEA generic. The FX woman saw me poking around, and wandered over. “A unique piece, isn’t it?” she asked. “I used to own this,” I said. “Years ago.” Surprised, she tried to recall the provenance by which it had come into the shop, but couldn’t. I tried to summon the provenance by which I had acquired it, and my memory was hazy, too. I said I’d owned it five or so years back, but I later realized that this was way off. I’d sold this table (on Craigslist) more than seven years ago, when I moved in with Tim and we had too much furniture. I’d owned it three or four years prior to that, having—I think—bought it at a yard sale on my own street in Somerville. It was a fun piece, but moving it around got old, and I moved a lot back in those days. Moving back to Boston has been a little like running into your old sewing table. I moved to Boston for grad school in 2003, and was here until Tim and I moved to Europe in 2010. We met here, got married here, got degrees here, and I had my first jobs here. Tim finished his PhD and we moved away. After our four years as expats, his job search could have taken us anywhere in the world (or in the US, really, since that’s where he was looking). And a work opportunity that seemed (still seems) like the perfect next step brought us… right back where we’d been. Boston—and when I address Boston, I mean the entire area here—some of the shine has worn off. I loved Cambridge in my 20s. All I wanted was a crappy little apartment there (and trust me, I had them). I still like Cambridge, and I half-wish we lived there, with the walkability to cafes and restaurants and bookshops. But I used to think that was (for Massachusetts) my Dream Place. My perfect spot. The one it turned out we couldn’t afford. And now when I’m there, it doesn’t seem as perfect as I remember. It seems dirtier. A little more crowded. People seem a little more rude. And yes–I’m not a twenty-something anymore, and it still feels like a city of twenty-somethings, which then takes a huge jump upward to wealthy middle-aged academics. There’s not a lot of room for thirty-somethings who haven’t made it big. Watertown has its pluses and minuses for us. The big pluses are our church and Sofra Bakery. The big minuses are the car dependency and the aesthetic starvation of my soul. We talk a lot right now about if we’ll stay here. And we talk in the bigger picture about if Boston is “it” for us, for a long haul. I’m not sure it is. Sometimes I think there might have been more of a spark to returning to the US if we’d returned to a new city, where we’d be more charged by learning a new place, discovering its little pockets and gems. Here, although the city has changed plenty while we were gone, we don’t feel the same curiosity, the same wonder at making a new find. But enough about us. One of the questions expats—and non-expats—try at some point to answer is: Can you go back? To your hometown, to your college town, to the place you lived ten years ago? Will you struggle to fit your grown self there, when an earlier iteration is there following you around? And can you return to a place you loved before, without being a little disappointed? Our experience has said it’s hard. That it’s like trying on an old pair of jeans. You might be able to get them on, and you might even discover that you don’t look bad in them—but you + they together are not the same glory combination you equalled two summers back. But as fashion experts (and my grandmother) always say, clothing trends–and furniture–are bound to come around. I write a lot of things down. In journals, when I feel disciplined; in random notebooks I buy because I like the covers; on loose scraps of paper and receipts and whatever was at hand when a thought struck. The paradox of the note-keeping is that I do it so I won’t forget an idea, an impression, or the fact that we’re out of toilet paper– but despite the distrust of my memory, and an overall lack of organizational system, I rarely forget the pages themselves. So there was a piece of paper I knew went missing circa nine months ago. It was a sheet of A4 printer paper I’d pulled out of my bag and scrawled some notes on, on the last day we visited Amsterdam. I wanted those notes, to preserve the city as it was to me that day, and so that I could turn them into a blog post. I wanted the notes because—on what seemed like such an important occasion—I’d forgotten our camera; I remember realizing it as we walked to the train. It was a weekend day just before we moved, and structure was somewhat less than normal. By the time I thought to search for my paper, it seemed too late to track in the chaos a plain white sheet. 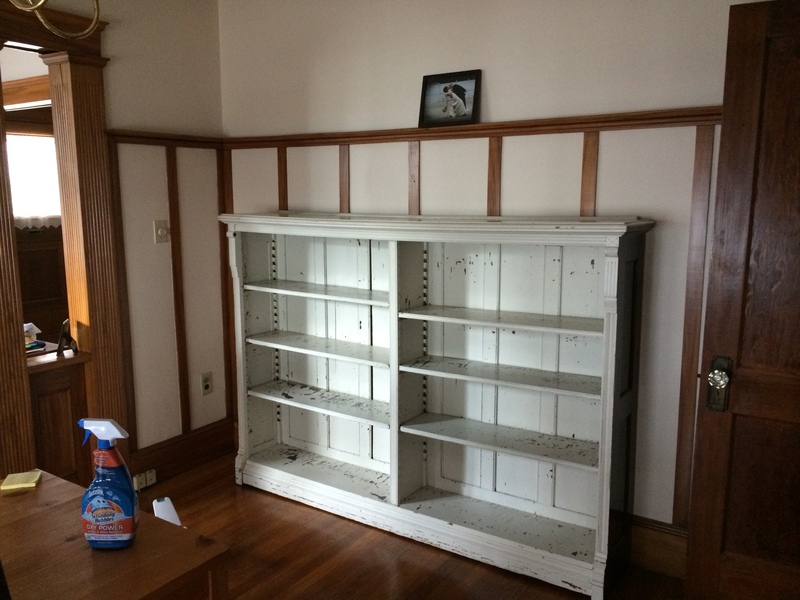 I combed meticulously through stacks created after I gave away my desk to a friend, accompanied by a bottle of wine because anyone who took an object from our house that week also received a bottle we couldn’t take with us. (So did anyone who helped us move an object from our house.) The notes never surfaced, and my last guess (aside from being recycled) was that they’d been mixed into the folder of pages we left for the incoming tenant of our apartment. I could only hope I hadn’t written anything too embarrassing. This morning, on the doorstep of 2015, I picked a book off the bookshelf that I wanted to give away. I’d started it months ago and lost interest. I thumbed through it and a paper slid out: white, soft, littered with my handwriting. And as I squinted at my own appalling scrawl, scenes sprang up so vividly I thought I could breathe their air. It had been tulip season, and from the train we saw the fields ablaze. The sun came out warm, I wrote, and Amsterdam was mobbed: throngs of tourists, tornadoes of pot smoke. We wandered down the Haarlemmerdijk taking in the usual sights: boats, bachelorettes, stylish Amsterdammers and a shirtless man drinking a beer by the canal. We stopped at Two for Joy, my favorite cafe, where I would often write when in Amsterdam. In honor of our last day, I touristed myself and bought one of the cafe’s logo espresso cups. The server couldn’t find one of the matching saucers new and asked if I would be OK with one that had been in use, taken from the drying rack of the cafe itself. I couldn’t have liked it more. We continued to the Noordermarkt, bustling and sunny, where we sampled pears and bread. We spent fifteen minutes at a vendor of old postcards: places we have been, places we haven’t. I bought one of Delft, intending still to frame it. We lingered near street musicians; I watched a girl pass with Obama stickers on her Dutch bicycle. I want, I wrote, to remember this. The last night we were in Amsterdam, we ate at a little Italian restaurant we’d visited several times before. Friendly, warm, gezellig, and neighborhood-feeling. The kind of place we always insisted we wouldn’t consume a whole bottle of wine, and then did. That night a man wandered in, one I could recognize right away as hoping to sell something. In cities all across Europe, we’ve been approached at restaurant tables while a man, smiling, wordless, seemingly always in a dark jacket, holds out a rose and waits until we become uncomfortable or say “no, thank you,” enough times. I have a complicated soft spot for these people, always curious what their lives are like and how much money you can really earn selling flowers table to table. But this man didn’t have flowers. Or Kleenex, or cheap greeting cards, or any of the other variations we’d seen. He had a camera. It was an old Polaroid, hanging around his neck, and as he approached our table he held it up, asking if we wanted a photo. I almost shook my head by default and then realized–yes. Yes, we want a picture; how perfect is this? I scooted around to the other side of the table, next to Tim, and the man snapped a single shot, waved it a little, and walked away with a few Euros before the image had even appeared. By many definitions, it’s not the greatest photo. We weren’t dressed up; we look like we’d been out all day. I’m wearing a drab sweater and scarf. My hair is short; I can’t believe how much it’s grown. Tim sports his Euro-goatee, which got the razor shortly after. In front of us on the table are a half-eaten pizza and a wine glass. The image is framed in such a way that we could be anywhere—the main background is a boring white wall—but out the window behind my head you can make out bike wheels in the dark. Amsterdam. 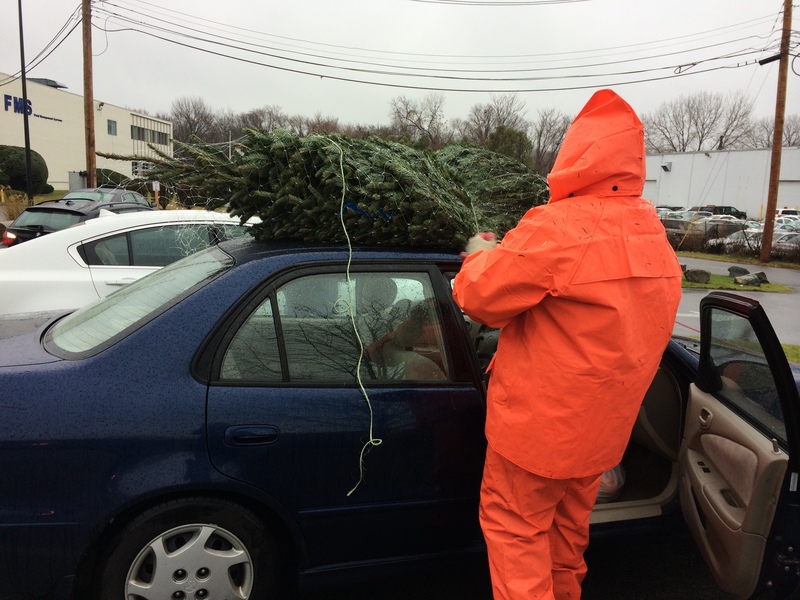 This December we brought a tree home on our car. This was quite the shift from previous years. We decorated with ornaments gathered from our travels, resulting in that wintry mix of joy and nostalgia. Over the holiday a relative told me that she checks my blog, but wondered why I hadn’t been writing. I’ve wondered that, too; all I’ve got is that there hasn’t been a lot to say. Closing a chapter is hard, and there are no notes you can find to help you through. The best analogy I’ve had for the time since our move is that it has felt like someone has died, or like a relationship has ended. At first it was unbearably heavy; then gradually it lightened, but the loss will catch me off guard on any given day. I didn’t make many resolutions for the new year, but most of the goals I’ve thought up involve writing. One is to use this space again, to talk about moving or travel or anyplace in between. Happy new year, and thanks for reading! When I told people that Tim and I signed up for a beginners’ French class, I got some wary responses. And he was not wrong. Four years in the Netherlands did not make either of us a fluent Dutch speaker. We never took a formal class; it was easy to get by with English; and Tim didn’t need it at work. He decided pretty early on that he had other ambitions for that time period besides garbling Dutch. I kept at my technique of active assimilation and turned out to know quite a bit in terms of vocabulary, but with basically no concept of grammar or structure. I am a pretty good reader and can pick up on a bit of conversation by listening… and then I’ll answer you in English. But it made a deep impression on both of us to leave the US and enter the multi-lingual world, where our friends switched easily from Dutch to French to Spanish to Portuguese to many, many other things. Foreign language classes in middle and high school were always a kind of whimsical study, like painting and geometry were for many of us: it was fun to try, but you didn’t really see yourself using it later on. One day a year students would bring in questionable renditions of foods from the country they studied, and generally someone got ill. If you had an especially active teacher and money, your class might have done a summer trip to Rome or Spain, but that never happened to me. Yet I think I chose something that inadvertently positioned me well for travel: I took Latin. My contributions to Food Day were minimal, and it was weird to be studying a language that at most was getting some use in the Vatican… but those Romantic roots stuck and made me a good guesser of signage and menus in a variety of settings. She was correct. The description had specifically indicated that this was a zero-level course, not even for those who took French 101 ten years ago. They speak in nouns, naming everything, as our niece Rachel did recently when, utterly excited, she pointed up at the sky and said: “A MOON!” This is a bit how I felt learning Dutch: “A fiets! Een zitbank!” Expression is an exciting thing. If Dutch is a language with a lot of hard consonants, grinding together in your mouth, French seems to be bewilderingly fluid. Four forms of one verb sound the same, but are each spelled differently. “Say that at your normal pace,” a woman asked the instructor after he had coached us through a sentence of three distinct words. When he complied, we were appalled. Was that anything more than a vowel? By guessing the meaning of the instruction “to spell,” I found myself put on the spot to spell my name in French. Scanning the pronunciation notes I’d just made, I drew a total blank. All I could think was: I forget how to spell my name. I considered shortening it. It felt like I took five minutes for six letters, and I’m sure that at least eleven out of thirteen people in the room had no idea what I said. Perhaps to my ignorant surprise, there was quite a mix of people in the small class. One girl who looked like a high-schooler introduced herself as Mexican; two retired gentlemen sat at a distance and sometimes declined to answer the exercise questions. The majority were women in their twenties and thirties, and not all had English as a first language. 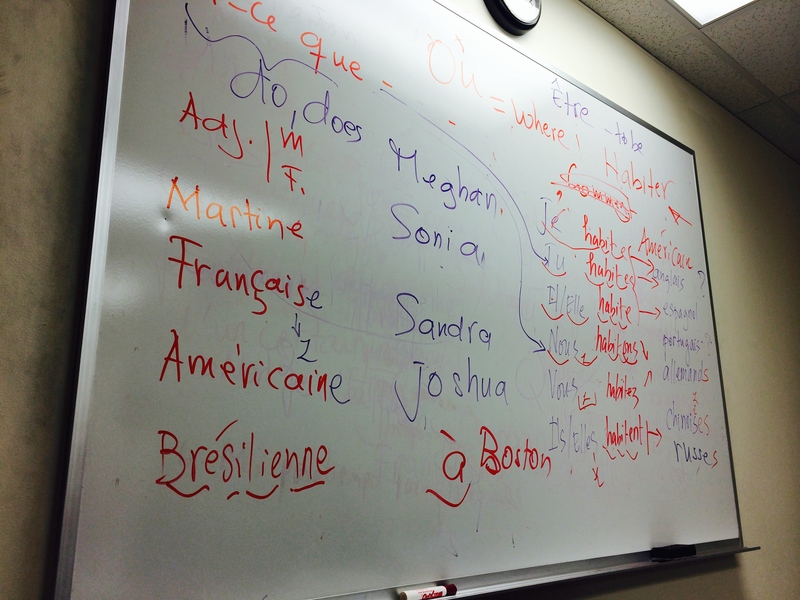 Some of their accents seemed to lend their first-week French a natural loveliness, in comparison to my halting “juh… swee…”. “Always,” our instructor lamented (to us all). “Always you are struggling with the negative form.” This is true, I thought: philosophically as well as linguistically. And the delight of calling things by someone else’s names is part of how we spark against that struggle. It is September 2, and summer is over. Although the calendar may tell you that summer turns autumn on September 21, in the United States summer is generally understood to conclude over the first weekend in September–Labor Day Weekend–going out in a haze of barbecue smoke. Labor Day (the Monday of the weekend) is a government holiday from the late 1800s, honoring the American worker by giving him or her a day off. I saw a news article yesterday that called out a certain irony here, given how little paid holiday the American worker takes compared to his western counterparts. In any event, it’s not a holiday that gives people warm fuzzy feelings, but everyone is pleased about the three-day weekend. 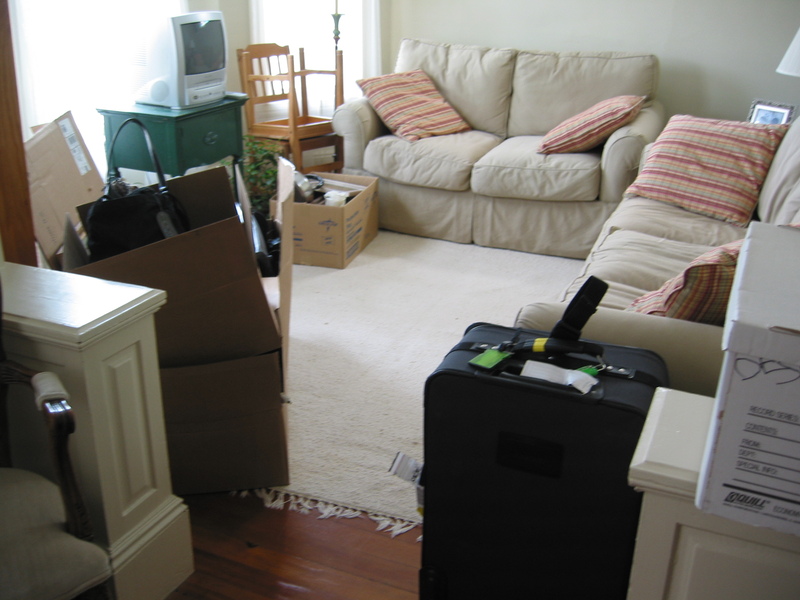 In greater Boston, September 1 is the prime moving date for apartment rentals. Furniture season, I used to call it. The streets yesterday were jammed with U-Hauls (many of them driven, Tim commented, by people who should not be authorized to drive large vehicles); and in 90-degree heat (32C), the new residents of Cambridge, Somerville, Watertown, and everywhere were lugging their boxes and mattresses. By accepted tradition–and in contrast to the Netherlands, where this would be ill-received by one’s neighbors–any unwanted objects are simply abandoned on the curb. They are taken away by happy freeloaders or the trash men, whichever happens first. Last night we attended a (literal) apartment-warming party that ended around the time the street’s electricity went out, the grid having presumably been overtaxed by the running of air conditioners. On the way to the party, I pulled the car over in haste to examine a lovely wood-and-glass coffee table, which is now sitting in my living room; and on the way home, we grabbed a full-length mirror. Today, many teachers (including my mom) and students begin the new school year. Lucky offices that operated on a summer schedule (half-day Fridays) return to their normal hours. The undergrads who swarmed back into this area over the weekend, clogging every store with carts of fans and plastic bins and magnetic chalkboards, will find their way around campus. And I, sometime in the late afternoon, will go out looking for dinner. I have failed to adapt out of my European habit of shopping daily for food. This has resulted in my own consternation: In Delft, the larger supermarket in town (the Bastiaansplein Jumbo) was 500 meters (.3 mile) from my door, and the Albert Heijn even closer (.25 mile). A trip for groceries could take fifteen minutes or less. Here, I can walk to a small Middle-Eastern grocery in about ten minutes, or to a large chain grocery store that I strongly dislike in about fifteen. Either of my preferred grocery stores is about 3.5 miles from home (in opposite directions), and an area with a few specialty food stores about 2 miles. I have been visiting weekly the Watertown Farmer’s Market and was surprised to discover a small local farm, tucked away in suburbia quite close to where we live. Good food can be bought in this area (though at a much higher cost than we are used to), but the spread-out-ness of everything is energy-sapping. Should I tell them it’s spelled wrong? Europe taught me so much about food. I went in as someone who enjoyed cooking, enjoyed being creative and exploding the kitchen in an artistic mess and ultimately announcing: “I made that!”. Over the years I cooked my way through new cuisines introduced to me by our friends, and with ingredients brought home from travels or the local markets. I even wrote here about cooking my way out of a funk–which may be what I have been sporadically attempting all summer. I may have moved to the land of Applebee’s and McDonald’s, my kitchen says, but you will not find me eating junk. This summer passed like a cyclone. In some ways it still feels like I just got off the plane. I still wish we were packing to go back, or preparing these foods for one of our Delft dinner parties. But fall is here: the season of pumpkins and roasted squash; of the first stews and of fleeces at night. Yesterday at a party someone passed me a pumpkin ale, and I thought: Is it that time? Already? It is that time. And I’m thinking that the fall will taste good. On Friday I rode my bicycle to the grocery store for the first time in the US. In contrast to my previous three-minute flit to Jumbo or Albert Heijn, this ride was 2.5 miles each way–but at rush hour to a busy, cloggy shopping center, I was pretty sure that it was going to be faster and less frustrating than driving. And also a lot more frightening. My bicycle makes me happy, and I felt pleased when I tugged it down the back porch steps and sat on it. I clipped on my dorky helmet (never wore one in Holland), stuffed shopping bags and water bottle in the saddlebags, and it was just like old times. Briefly. It was very much not like old times when I had to immediately hop off the bike to push it up the steep part of our street (no gears on the oma fiets). Having reached the end of the street and waited for the pedestrian crosswalk signal, I had a few minutes’ ride through a residential neighborhood. There were no bike lanes here, but the roads weren’t busy. Unfortunately, I was soon past this area to the middle stretch that I had determined would be the daunting segment of the ride. These were two fairly busy roads with periodically appearing / vanishing “bike lanes.” On a bike, I felt the hugeness of the cars here. You only have to drive around to realize that the roads and parking lots are not designed to accommodate the massive SUVs suburban moms and dads are hauling around in. I felt extremely exposed to the (annoyed, texting, hurried) cars, and on the way to the store I chickened out and rode for a while on the sidewalk. The cyclists I see in the Cambridge, MA, vicinity are predominantly of the urban-warrior variety: messenger bag, clipped in shoes, all kinds of gear, zig-zagging around cars and through lights like the laws don’t apply to them. (There are also the sensible cyclists who wait at red lights and flinch a little when trucks rumble by.) I have a large-wheeled, heavy-frame, one gear bike with grocery bags on the back. It did, on this ride, feel a bit like the wrong equipment for the task. And although I was overheated and overdressed in my pants and reflective jacket, I felt like I should have been wearing shin guards, a chest protector, and probably some Kevlar. All of that said, I felt extremely progressive and triumphant when I locked my bike to the small rack outside the Alewife Whole Foods (an urban cyclist girl giving me a very strange look). I looked at all the cars stuck in the rotary and hunting for parking, and I walked into that store and I bought my dinner. And when I passed a cool, tough cycling guy carrying his helmet while he shopped, I gave him the head nod, like we were in a club. I breathed a little more normally on the ride home. I was sad, too. I was sad to live in a place where maintaining the active lifestyle of cycling requires so much risk. I was sad that “getting groceries” has gone from as short as fifteen minutes door-to-door to what seems like a minimum forty-five minute venture. I wondered if I will have the toughness to keep at cycling around here. Of course, to the Dutch cycling is still not just “an option,” but the option. We have three Dutch friends currently in Cambridge, and we invited them for dinner on Saturday. Knowing it was a long ride including crossing a major road or two, we offered to pick them up in our car. This offer seemed to be insulting, and they showed up that evening (flying down our hill and passing the house) with their BBQ contributions in their backpacks and one of them a little bit tired (she’s several months pregnant, after all). When it began to get dark, they clipped on their lights and headed up the hill, the couple doing that lovely Dutch thing where the weaker cyclist puts an arm on the stronger cyclist for some added momentum. For them, having grown up with the cycling culture, wherever you go, it’s just like riding a bike. As I finish this post I’m reminded that though I haven’t “talked” about it here, we and people we love felt very much affected by the crash of flight MH17. It’s been said that the Netherlands is such a small country that everyone knows someone who was on the flight, or knows someone who knew someone. In our case two unrelated friends each lost a colleague, one on holiday and one on the way to the AIDS conference. Friends in Delft and the Hague told us of hearing the long, tolling bells across the country on the day the first victims were flown home. As news stories (of all magnitudes of awful) appear and disappear in our headlines, I hope that people will see this one through: to not forget what happened or to ignore what continues to unfold. One effect of Boston’s summer heat is that it makes me feel like I’m on vacation. Delft’s seasons don’t run as hot and cold, and there weren’t many genuine shorts-and-tank-top days (by my reading, not the TU Delft undergrad-girl reading) per summer. I like the hot-hot days, and for the last four summers I’ve associated them with the Mediterranean: Ostuni. Dubrovnik (lord, it was hot in Dubrovnik). Barcelona. Ventimiglia. The places where everything shuts down in the afternoon because it has to, because the only thing you really can do is swim or siesta after a fresh lunch with a glass of white wine. The places optimized for that thing you always heard about as a kid where you could cook an egg on the pavement. With our warmest days peaking around 90 F, OK, it hasn’t been Mediterranean hot. And as I look out my front windows to a suburban leafy street where cars and the occasional rogue cyclist rush by, the atmosphere is rather altered as well. But this past Saturday, sick of unpacking boxes and sorting through old photos and files and whatnot, I went online looking for weekend activities and found another Italian echo: the St. Peter’s Fiesta in Gloucester, MA. I have memories from growing up of the Catholic church in our town having a carnival every summer. (A kermis, we’d say in Holland.) But when we were in Italy it was my thrill to stumble several times upon Italian saint festivals: lights on cobbled streets and men in their suits in the evening heat, somber-faced as they carry a gigantic statue through the town, while women behind them bark prayers into megaphones. The local band follows with a march. Gelato is scooped late into the night and the saint eventually retires to the church for another year. Last summer while in residence at the lovely Palazzo Rinaldi, I was taken by my hosts to a small nearby village for an event known as the Festa della Pita, the identifying feature of which is that men hoist a tall stripped tree trunk, and then try to climb it to earn prizes. This perfectly primed me for the Pita’s horizontal cousin in Gloucester: the Greasy Pole competition. During the five-day tribute to the patron saint of the seaside town’s fisherfolk, a thick wooden pole is stuck out over the water, slathered with grease, and given an Italian flag at the far end. We made the one-hour drive to Gloucester on Saturday with greasy-pole viewing high on our agenda. We headed to the beach after a quick stroll through the town: quaint and pretty, with some tempting Italian cafes, and gift shops selling over-priced sea-themed trinkets. The pole and platform had been erected a short distance out from the beach, nearby a massive conglomerate of boats: a floating party, of everything from kayaks to speedboats, with swimsuited people moving between. It was a hot day, but the water was still cold. The opening act for the greasy pole was the Seine Boat Race—three rowboats labeled the Nina, Pinta, and the Santa Maria, each manned by about ten guys, racing each other to some point on the horizon and back. The race was fun enough, but heavily negated by the long maneuvering of the boats into position and a ridiculous string of false starts. A cheer went up when a large, pontoon-style boat ferried all the contestants out to the platform for the greasy pole, where I can only presume they took some time to sober up in the hot sun and remember why they had agreed to do this. As the crowd on the beach grew enormous, the first man stepped up onto the pole, promptly fell off, and the action was underway. The objective for these men–some in bathing trunks, others in everything from superhero costumes to a suit–was to get that flag. As each man’s effort tended to last between zero and four seconds, the line cranked right along. After a half-hour, only one man had made it past the halfway mark, but had tumbled into the water before grasping the flag. We began seeing repeat contestants and wondered how the rules were defined: does the event simply continue until a) everyone quits or b) the flag is won? Although attempting the greasy pole seemed fairly unsafe (some contenders fell straight to the water, but others smacked various body parts off the pole en route), the local police, fire department, and Coast Guard were all represented on the water–I suppose in case anyone were to become seriously injured. This struck me as an American touch. I confessed that I did not know any of the contenders. The whole group swam toward shore, the champion with the flag held high, and as soon as they reached land, he was pulled up onto others’ shoulders and whisked away into the streets. We had intended to drive home and make dinner, but the lure of the seaside atmosphere became too strong; so we wandered the town while the sun sunk and had seafood at a restaurant. Probably two hours after we’d left the beach, through the restaurant windows we saw the champion pass by, still clutching the flag, flush with celebration. The entire place cheered, and to me, it felt like summer. Unquiet Time · Because life is loud.